Monkey bread consists of several pieces of soft bread either filled with a stuffing or coated with spice powders like cinnamon etc.Usually monkey bread is prepared as a sweet pastry though many savoury versions do exists.This bread is traditionally served hot so that the baked pieces can be easily torn away with the fingers and eaten by hand. 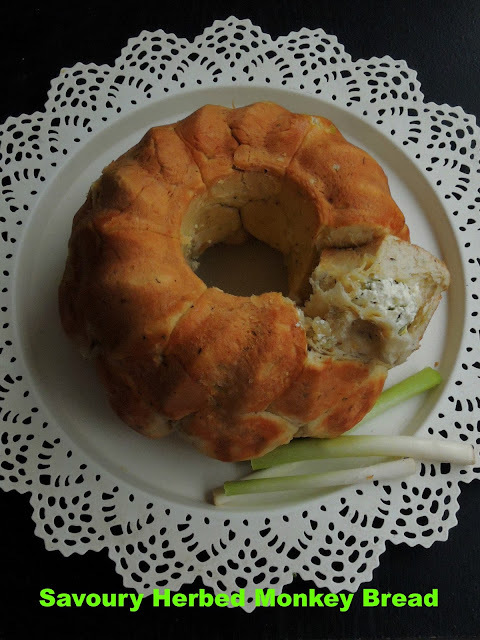 Today's savoury monkey bread is definitely an easiest one, very simple to prepare,quick to shape if you have yeasted dough at home. This finger food makes an excellent evening snacks especially if you have some hungry tummies around you. 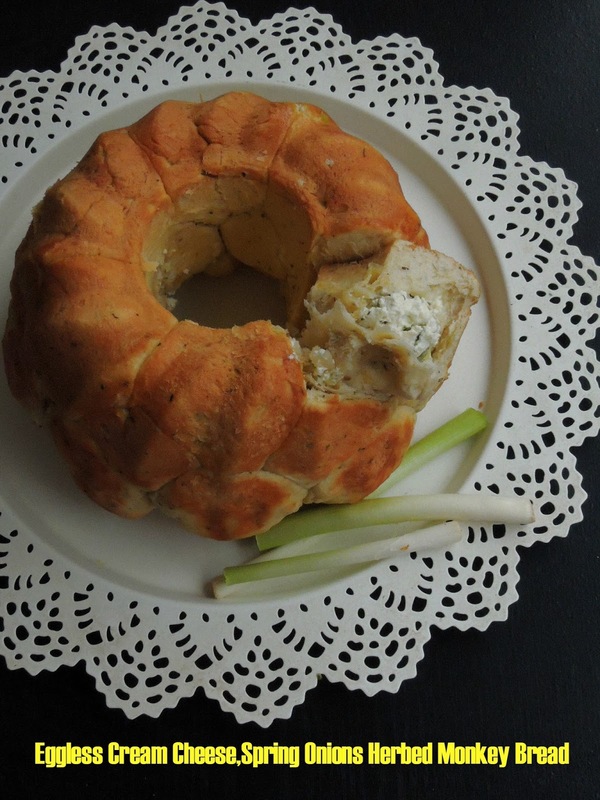 Already filled with spiced cream cheese and spring onions, you doesnt need any sauce or dip to serve along with this monkey bread. If you are a regular reader of my blog, you might have noticed that am not that much regular in posting apart from pariticipating blogging marathon, a monthly event which calls for three days of blogging. Since am getting professionally busy, my blog baby is taking a back seat however am trying to blog atleast once a week especially for blogging marathon. 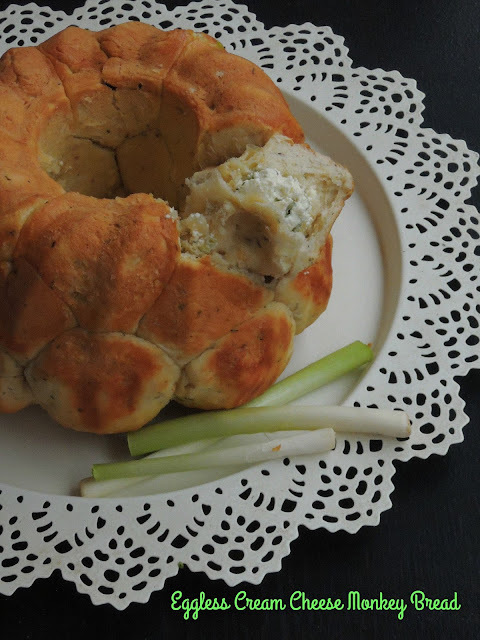 Am blogging this week's blogging marathon with Pull apart bread as theme after two different interesting eggless and vegan pull apart bread, my last post under this theme is this interesting aromatic herbed monkey bread stuffed with cream cheese and spring onions. In a large bowl, take the flour, rolled oats,instant yeast, salt,mixed herbs,oil and sugar, add the luke warm water gradually and knead everything as a smooth dough. Take a bundt pan or a round pan, greased it. Punch down the dough, divide them into 25-30 small tiny balls. Meanwhile take the cream cheese, chopped spring onions, chilly flakes and pepper powder in a bowl, mix well, keep aside. Flat each ball and drop the already prepared cream cheese filling, bring the edges together and roll them well. Drop them to the already prepared bundt pan. Keep in warm place for half an hour. Turn the bread, pull a bread and enjoy. Wow , priya you rock ! What an amazing bread with awesome flavors. OMG!!! wonderful combo and bread looks great. you guyz rock with pull apart breads. A truly flavorful bread that is! Loved the way you made it. Yet another fantastic bread Priya..I enjoyed all your breads.. I'm literally drooling over your clicks Priya. That spiced cream cheese sounds absolutely delicious.